The future for Intel 's P965 chipset is a bright one, particularly with Core 2 Duo processors finally rolling out the door (actually, physically so). Aside from PCI Express x16 videocard support, the Intel P965 chipset leads with a 1066 MHz front side bus, a new 12.8GB/s 'Fast Memory Access' memory controller, and a few other technologies we'll touch upon momentarily. Released in tandem with the Intel 975 chipset, the more economical 965 core logic is likely to be the real favourite of the show with most consumers. As PCSTATS embarks upon the review you've come for, the Gigabyte GA-965P-DS3 motherboard, it's worthwhile to note that little has changed since Asus and Gigabyte merged. Both Gigabyte and ASUS will maintain separate product lines, but the motherboard manufacturer is now among the largest in the world. The only direct competition left comes from the industry behemoth Foxconn, which aside from its own brand of motherboards figures into just about every single motherboard produced at some level.... but that's another story. 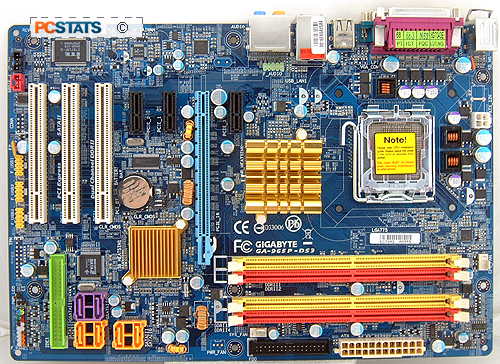 Gigabyte's GA-965P-DS3 motherboard offers a good mix of performance and value for the Intel Pentium D or Core 2 Duo microprocessor. The board itself retails for a reasonable price of $156 CDN ($140 US, £75 GBP) with scant little in terms of bundled in accessories. The GA-965P-DS3 is made for Intel's remarkably proficient Core 2 Duo processor series, and for the purposes of this review PCSTATS will be testing it with an Intel Core 2 Duo E6600 CPU - the sweetheart of the bunch for its 2.4GHz clock speed and 4MB of L2 Cache. Featuring Intel's P965 Express northbridge and ICH8 southbridge chipsets, the Gigabyte GA-965P-DS3 motherboard supports all Socket 775 processors from the flagship Core 2 Duo/Extreme to the Pentium D/4 and Celeron D. Either 1006MHz Front Side Bus or 800MHz FSB is the number to remember, but it will also accept 533MHz FSB chips if you're really strapped for a chip. The ATX motherboard's four DDR2 memory slots accommodate a maximum of 8GB of DDR2-533/667/800 RAM, and unofficially at least it also works with DDR2-1066 memory modules. There are a few integrated devices outside of the standard collection associated with the P965 Express chipset; such as an IDE controller, 7.1 channel Azalia High Definition Audio and a 10/1000 Gigabit network card. User's Manual, Driver CD, Hardware Installation Guidebook, Ultra/133 IDE Cable, Floppy Cable, Four Serial ATA Cables, I/O Shield, Gigabyte Sticker. The Gigabyte GA-965P-DS3 motherboard features three PCI Express x1, three 32 bit PCI slots, and a single PCI Express x16 slot for graphics cards. The variety of expansion devices will make it easy to build a computer that fits your requirements, without forcing the total abandonment of PCI cards from an existing system being upgraded, for example. As for external devices, the GA-965P-DS3 motherboard has four USB 2.0 slots on the rear I/O and there are headers for an additional six slots by the bottom PCI slot. It's a bit odd, but there are only four 3GB/s Serial ATA II channels associated with the ICH8 Southbridge, two additional slots (in purple) and the lone IDE channel (green) are linked with the on board 'Gigabyte 3GB/s Serial ATA II controller.' Ultimately, that results in a platform capable of supporting six SATA 2.0 hard drives, and two IDE devices. The Gigabyte SATAII ports also include RAID 0, 1 and JBOD capability. A floppy drive connector and 24-pin ATX power connector round out the list of jacks on the motherboard itself, while at the rear I/O we also find optical SP/DIF and coaxial audio outputs among the usual assortment of USB, parallel, COM, RJ-45 GbE network and 7-channel audio jacks. One of the oddest aspects of the Gigabyte GA-965P-DS3 is promoted all over the front of the box. I would have never thought that the type of electrical capacitors used on a motherboard could sway the average consumer looking to build a PC, but obviously I've underestimated just how tech savvy consumers have become. Gigabyte proudly state that the GA-965P-DS3 uses only "higher quality solid capacitors" instead of standard electrolyte capacitors. Remember that recurring problem with burst electrolytic capacitors which blossomed into a full blown epidemic a few years back? Well it evidently, burst and leaking capacitors continue to be a problem for the industry. 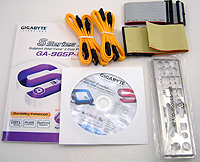 The Gigabyte GA-965P-DS3 uses Chemi-con conductive polymer aluminum solid capacitors of the kind pictured at left. 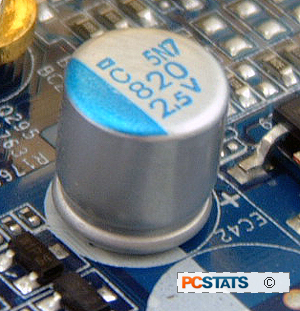 These are the same type of capacitors mostly found on videocards, or in the CPU's power supply circuitry. The gist of the situation is that Gigabyte have produced a motherboard with only this kind of capacitor, because it is supposed to improve overall stability of the motherboard as well as its longevity. Being a solid device, the physical conditions which caused poor quality electrolytic capacitors to fail and burst after 3 years is a non-issue. If you'd like to read up on the back story of espionage that led to the whole problem of burst and leaking caps, see this PCSTATS article.